Barbie is bungie jumping in math class! | What do self regulation and standards based education have in common? Barbie is bungie jumping in math class! 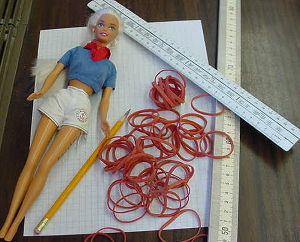 Looking for success stories with a positive twist I found one about a middle school Geometry class where students learn how many rubber bands will provide the maximum amount of bungee jumping thrill for a Barbie doll, determining how far they can drop her from the ceiling to the floor before she makes impact. I would love to be in that class! When I searched the web I found many links, videos, and images of this new way of teaching problem solving as encouraged by the common core. In classrooms all over the country Barbie and Ken are bungie jumping from staircases, the tops of lockers, and ladders, only to name a few. The story is from an Oklahoma teacher who commented about his students who are collecting data, using data to make predictions, graphing their results, and they’re learning about slope and linear relationships. The best part is that they persevere in this problem solving assignment. They don’t give up, because they really want to see if and how it will work. The Barbie Doll problem is one of many ways to see a common core standard in action. “Make sense of problems and persevere in solving them” is one of the first of the new Common Core math standards. When the common core brings math to life, we can all agree, it can be a good thing. More about this story can be found at the National Education Association’s website, a great resource for common core learning experiences.